Last week, The Seattle Times’ Jessica Lee posted a nice piece on the reopening of Bob’s Meats. There’s even a video that walks us through the damage of the fire. To read the full piece, click here. …The store at 4861 Rainier Ave. S. started taking orders again earlier this month, though with a slightly modified menu. Last-minute building preparations cut time for smoking some of the store’s big meats, such as its popular fresh turkeys and hams. “It’s good to have him back,” customer Mark Holtzen said of James Ackley. Holtzen has been buying meat at Bob’s for 10 years. The meat shop sells hundreds of hams each Christmas season and more than 500 fresh turkeys each Thanksgiving. The store packages about 150 pounds of homemade sausage on an average day throughout the year, and at times, Bob’s offers more than 100 varieties of chicken, beef, sausage and pork. The advertised selection runs the gamut, from unique delicacies such as pig hearts and oxtail, to the classics, such as drumsticks and rib-eye steak. Bob’s sells to downtown Seattle restaurants and across the country, continuing a long-running, meat-cutting tradition. Joe Ackley, James Ackley’s grandfather, started the meat business more than a century ago when he sold meat off a wagon pulled by mules in the Yakima area. After the invention of refrigeration, he opened a shop in 1909 where his sons, including James Ackley’s father, Bob, helped prepare meat. In 1963, Bob Ackley moved his family to Seattle and opened a shop in West Seattle. Then in the late 1970s, the Ackleys took over another family’s meat shop in Columbia City, where Bob’s continues today. This past July, a two-alarm fire melted the ceiling and walls of Bob’s Quality Meats, the Columbia City butcher shop that has been run by the Ackley family since the late 1970s. (The building, built in 1892, has been a meat store, owned and operated by multiple generations of two different families, since 1909.) The fire caused more than $300,000 in property and product damage. As customers, myself very much included, mourned the closure of Bob’s, owners James and Thien Ackley vowed that they would return. As of yesterday, Bob’s is back in business. When I stopped in yesterday morning just after 9 a.m., hoping to buy pounds of the excellent housemade chorizo, bratwurst, and Cajun boudin blanc that I’ve been missing for far too long, I was disappointed to find the door locked. But James Ackley was nice enough to let me in, even though the sign in the window read “Closed” and the brand-new meat case that runs almost the entire length of the store was empty, save for a few steaks. Ackley said they would be opening the doors at 10 a.m., even if they didn’t have much to sell right away. People who have been shopping at Bob’s for years will be relieved to know that the place has the same familiar layout and feel, but with a few upgrades. Refrigerators and freezers line one wall, soon to be filled with assorted frozen meats, lard, and bones for making stock. A shiny metro shelf rack holding a big box of yellow onions awaited other basic pantry items that Bob’s always stocks so you don’t have to make an extra trip to the grocery store. Along with the new meat case, the Ackleys have taken out the old fluorescent track lighting and replaced it with antique-looking milk glass hanging lamps. Above the meat case, though, hang lights that point toward the Ackley’s long family history. The corrugated tin lamp shades are the same ones that hung in the butcher shop Ackley’s grandfather, Joe, opened in eastern Washington in 1909. Ackley’s father, Bob, opened his store in West Seattle in 1963. James Ackley took over the Bob’s Columbia City shop in 1997, and his own son, Abe, now manages much of Bob’s’ day-to-day operations. The family has been working hard for the last five months to get Bob’s back up and running, but they’ve also relied on support from the community. 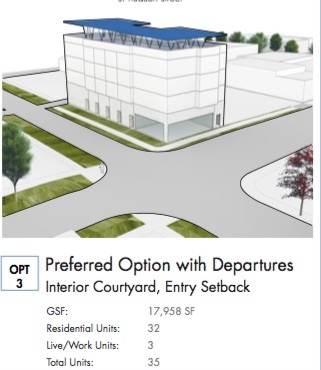 The Ackleys placed petitions at neighboring businesses such as Columbia City Bakery, Full Tilt Ice Cream, and Tin Umbrella Coffee to collect signatures as part of an application process for a Saving Landmarks grant from 4Culture and King County. The family received $200,000 to restore the historic building and their family legacy. Just before Thanksgiving, the busiest time of year for Bob’s, the Ackleys received so many requests from customers who order their signature smoked turkeys for their holiday dinners (Bob’s typically sells around 500 of them every year) that they went ahead and took a limited number of orders. Because the butcher shop was still under construction, the family sold them out of a refrigerator at Claws & Paws, the pet shop they own in nearby Hillman City. ( December 2015) Columbia City’s newest consignment shop is slated to open December 4, 2015. PHASE TWO INTERIORS will feature fine HOME consignments from the unique to the practical. All merchandise is gently used, consigned from individuals or estates, and includes everything from sofas, dining, living and bedroom pieces, original artwork, home accessories and lighting. Owner, Gigi Buchanan, brings her 14 years of furniture consignment experience and expertise to PHASE TWO INTERIORS, and looks forward to working with the Columbia City community and the Greater Seattle area to bring stylish home furnishings in excellent condition at affordable prices. She wants to further strengthen Columbia City’s reputation for high-end consignment and re-sale, and to help support and strengthen the existing shops like Green Eileen, Gather, Hunt, and Chrysanthemum. With construction complete, PHASE TWO INTERIORS is located at 3808 S. Edmunds Street just around the corner from Starbucks on S. Edmunds Street. Buchanan states that the building is ideal for furniture in that it has no columns to restrict furniture layouts or displays. The original structure of the roof is made up of historic timbers each 40 ft. long and 20″ high. Buchanan has retained those timbers, as well as retaining the original wood floors. Buchanan will offer high quality, brand name furniture, at affordable prices, to put into your home immediately – not furniture from garage sales, thrift and discount furniture stores, but timeless pieces to enjoy for a lifetime. Please stop by or go to www.phasetwointeriors.com for more consignment information or call the store at 206-457-8419. There’s no official announcement on their website or Facebook page, but the sign in the window seems to suggest Columbia City will be getting Bob’s back very soon. 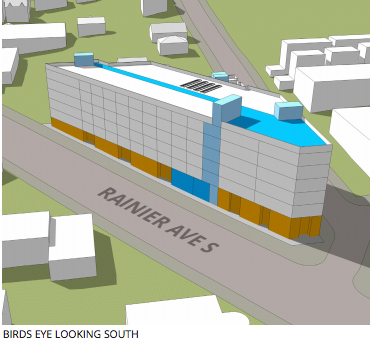 As Columbia City continues to undergo large-scale development, public reaction to new projects like the Angeline has been mixed. According to some long-term neighbors, the rapid construction projects and new shops introduced over the past few years not only signal gentrification and changing demographics, but an altered culture from what originally drew them to the south side. PCC. Vino Verite (now open). Super Six. Salted Sea. All the Best Petcare (coming soon). Pagliacci (coming soon). 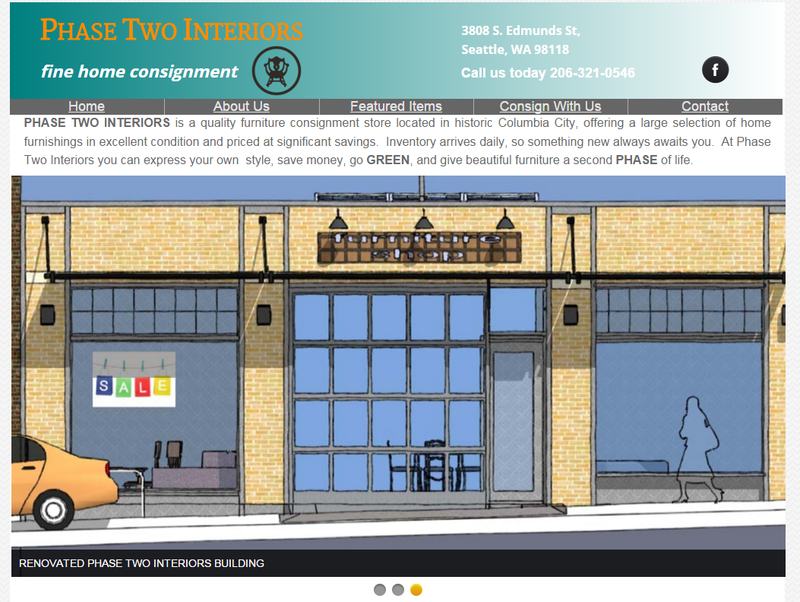 Walking by today (and doing a little sleuthing on the web) suggests that the next new business to open its doors will be Phase Two Interiors–a furniture consignment shop just East of Rainier on Edmunds. Peeking through the windows, the remodel to the space appears to be nearly finished and there’s already a large selection of furniture ready to be displayed. Phase Two already has a website up and running (although limited at this point) that provides some hints as to what we can expect. No exact date on when the doors will open, but all signs point to it being very soon.